A UBEC “Universal Battery Elimination Circuit” is an external electronic circuit that taps power from your motors battery pack and regulates the voltage down to the necessary voltage for the receiver and servos. The maximum input voltage will vary according to the UBEC specs. Some can handle a higher voltage than others. The preferred output voltage setting is usually user selectable. This power is now available for your receiver and servos – eliminating the need for a “separate” receiver battery pack. It does not replace the speed controller. However, it replaces the BEC “Battery Elimination Circuit” function in the speed controller, with voltage control capabilities and more available current. WHY DO I NEED A UBEC? Most ESC/ BECs are only rated for about 2 amps, on the BEC “Battery, Eliminator, Circuit,” the 2 amps is not a true rating, it’s less than that, If you’re using 3 to 4 servos, Digital servos, standard size servos, a 4 cell lipo or bigger, you need to be using a UBEC Circuit or the BEC in the ESC could get over loaded and cause a Crash. 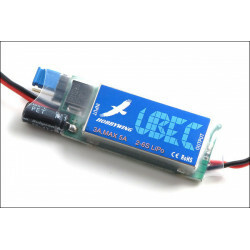 Hobbywing UBEC 3A 2-6SThe 3A-UBEC is a switch mode DC/DC regulator, it outputs a consistent sa..